I have lived here now over 2 years. The Executive Management is excellent in every way: helpful, attentive and cooperative. Excellent maintenance staff. Recent additions great: fully renovated library, fresh Farmers Market products free to residents daily, large fully equipped movie theater, comfortable apartments. My parents are in Acacia Springs. I also have a friend from my bible study group that's there. The staff is pretty good. The place is immaculate. The first thing I noticed when I walked in was there was no smell. It's clean at all times. I've never seen it even halfway dirty. My mother gets good maid service and she is very happy with her. My parents are not joiners, but it seems like they have something going on at all times. They have trainers in the summertime for water exercises, an Olympic-sized swimming pool, which is very nice, a salon that's open three to four days a week, a movie theater, computer rooms, a library, and laundry rooms. They provide everything, even soap. They have bus service and it seems to be pretty good. My friend loves it there. They had a real bad sprinkler problem and the alarm went off and on all night. It lasted three or four days, but they seem to have it under control now. We brought our good friend over to Acacia Springs a year ago. He was very hesitant at the time. One year later he loves the Community. Friendly, lots of freinds. The staff has been very supportive and he is happy. Best move we made for him. I found the staff of Acacia Springs to be very friendly. They always wanted to know if I was comfortable and if there's anything I needed. They showed me the facilities and what the person would have for the living quarters. The food was very good. We enjoyed that too. The rooms were very nice. However, I don't think a studio would have been complementary to me because I don't like to sleep, eat, watch TV, and work on my computer all in one room. I want a 1-bedroom unit. I felt that was very nice, but I think they needed to upgrade their kitchens a little bit. We went with Acacia Springs. We chose it for the amenities and the price. They have a pool and an exercise area. The other ones didn't have those. The rooms are OK. They're clean, but they're small. Acacia Springs is a beautiful facility, and it seemed to have everything I would need, including my dog. He's a little bit bigger than what they would normally accept, but they didn't have a problem with him. My apartment is a little over 500 feet, and it was one bedroom. My full-sized bed sits in it comfortablly with a mid-sized dresser, and my apartment was freshly painted and had new carpet put down. It has a nice big bathroom, and I did have to buy new furniture for the living room because everything I had was too big, but it looks pretty cool. I am learning something new every day, and the people are just so helpful. I had an ambassador assigned to me who's a lovely lady who lives across the hall from me. She's there if I have any questions, and she's just a delightful lady. Everybody I've met has been so sweet, they act like they're all one family, and we all learn from each other. Acacia Springs was elegant, clean, friendly, and well staffed. The amenities and the staff stand out. It’s some place I would like to live one day. The reception and the gentleman who showed us around at Acacia Springs were very nice. The rooms were nice, but it was just too far. It was more expensive, and the closets weren't as nice. I like storage and not being all crammed up all the time. Acacia Springs was very nice. I toured the place with the director; we went through the rooms and made a complete tour. They have a very active state for the people, and they have a lot of activities going on. It was independent and assisted living. It’s in a very nice location. Acacia Springs was too apartment-like. My sister said there were more old people in there and most were in walkers or wheelchairs. It was very quiet and clean but seemed older and needed updating. Acacia Springs was nice. The staff member was very informative and showed us everything. There were activities when we went there. Acacia Springs was very clean. Everything was fresh and had a fresh smell in the air as well. It was modern, and everything looked so inviting. They had two types of rooms; one type was for those allergic to carpets and had laminated flooring. Both units that they showed me were in excellent condition and very clean. The gourmet menu was outstanding. You can have salmon or you could order something at random if you don't want to have dinner. They also had helpers around to assist the patients. There's one floor for people who needed assistance and another for those who didn't need assistance. Everyone we spoke to was very professional and very cordial at Acacia Springs. We talked to a couple of the people who lived there and the biggest complaint was about the food. The food was not a good topic to bring up because we were told it was very bland, insipid, and not of good quality. The staff was professional, prompt, efficient, and friendly. They had a nice pool and gym. My relative has lived there several months. The staff and most residents are friendly and nice. Activities varied & fun. Even though there are choices in the dining room, some 'just home cooking' would be preferred by many residents instead of fancy named dishes that leave much to be desired. Fewer items better prepared would be lovely. The staff is very accommodating with requests by residents or guests who visit. Seasonal decorations liven up the hallways and public spaces clean in a inviting. The staff is easy going and nice to work with and the van drivers very nice. It would be nice if a link available for family to download schedules and weekly menus. Thanks much. Thank you so much for your comments. We are currently reevaluating our dining program and appreciate this feedback. Thanks again! Acacia Springs is beautiful. I like all the amenities. Everything is just right. The rooms are perfect. It was surely spacious. The activities were good, but I think live entertainment would make the place better. The food is great, and they have a lot of choices. I visited Acacia Springs, and it's a very clean and welcoming environment. It is small enough that it would not be overwhelming to someone new to that environment. Everybody seems fairly comfortable with the surroundings, and the staff was attentive. Their rooms are satisfactory. In the beginning everything was fine. The sales representative for Acacia Springs did a very good presentation regarding what they have to offer and the living arrangements. Now she expected more entertainment. What they publicize is not as accurate as it should be. As for the food, the chef's cooking daily for the tenants was not as good as she knew before she moved there. The rooms are very small, and they don't have a kitchen; it only has a bar. There is no kitchen so she can't cook for herself. Upon arriving there, we were greeted by very friendly people. It was around the holiday season, so it was a good time. One of my old friends lived there, so immediately there was a connection which made it more sensible to live there. She felt more comfortable there. As for the grounds, they have a pool area, an activity area, and a beauty parlor. They have a library where they have movies that play on a weekly basis. However, instead of posting what movie was playing on the movie theater, they post it on the front door. So if you want to watch a movie, you have to go downstairs to see what is playing. Everyone is not on the same page, and everyone is not working together in unison. It was very clean. It is an older property, but it is well kept. I visited Acacia Springs with my mother. The room was very nice. It had a living room, a little dining room area, a bedroom, and a bathroom. The staff was very professional. We walked in without an appointment, but they took us on a tour. They had a library, a hairdresser, a couple of outdoor places that were nice, two TV rooms, and a living room. It sounded like they did a lot of things. They had a board of all of their activites. It was like a bulletin board where they had a calendar of events, and it looked good. When we were there, the ladies had a teacher or instructor, and they were painting their nails. The dining area looked clean. My sister lives at Acasia Springs. I like the people there; they’re very good to my sister. They take care of her. They had a lot of activities going on. Her room is fine for her. She doesn’t spend a lot of time in her room; she’s out doing stuff. I’ve eaten there; their food is good. The dining room is spacious. They have 2 dining rooms. I’ve tried to get my friend in there, and they have a waiting list. I found Acacia Springs completely fine as a whole; that’s why it was my first choice and still is. It's the only 5-star place in town. I've been there twice, visiting, having a meal, and touring. The place was really nice. It was clean, pretty, and much like family-run. They were very helpful, kind, and offered choices. I like it because food is great. They have special diets on request, two side dishes for lunch and dinner, a chef, a real restaurant style, and a 24-hour snack bar open. They come to your table to take your order and menu choices. According to their calendar, they have something going every single day. They have transportation services to take you shopping, to medical appointments, or for anything you need. But I have to go back and check out the prices and see what is what. Everybody at Acacia Springs was so friendly and very accommodating. They bend over backwards for you. They've got a couple extra cars in case you have a special appointment you need to go to when the bus is not running. The food was very good and everything looked nutritious. One time I had a hamburger, I had fish and chips and Salisbury steak and it was all quite tasty. I wanted to keep my parents there but it was too pricey for them. They had tremendous amenities but at my parents' age, they weren't able to take advantage of the amenities, the swimming pool, the golf course and the putting green so they looked for some place that was cheaper. I've been in Acacia Springs for about and a week and a half now. Everything is good. They've been excellent and we're very happy. We moved my mother-in-law to LV from an assisted living home in Florida. We visited approximately 20 facilities and narrowed it down to 3 with our final selection being Acacia Springs. Our decision was not entirely based on the facility (which is lovely) but because we took the time to chat with residents on each of the return visits we made. A few of the people we met had lived there more than 5 years and they totally LOVE being there. They raved about the staff and care as well as the food and activities. The Marketing Director was excellent and she as well as all of the staff made the transition feel practically seamless. My mother-in-law thinks the care givers are fantastic and my husband and I think they are all angels. An additional facility plus is all of their apts are one or two bedrooms vs. just a single room and their prices are comparable to facilities with just the single room. I looked at probably 10 places before choosing to live at Acacia Springs. I have never regretted my decision to live there. I thoroughly enjoyed my time there. It was more like a real home. I felt completely independent but the staff was always there to help me if needed. I highly recommend Acacia Springs to all my friends. 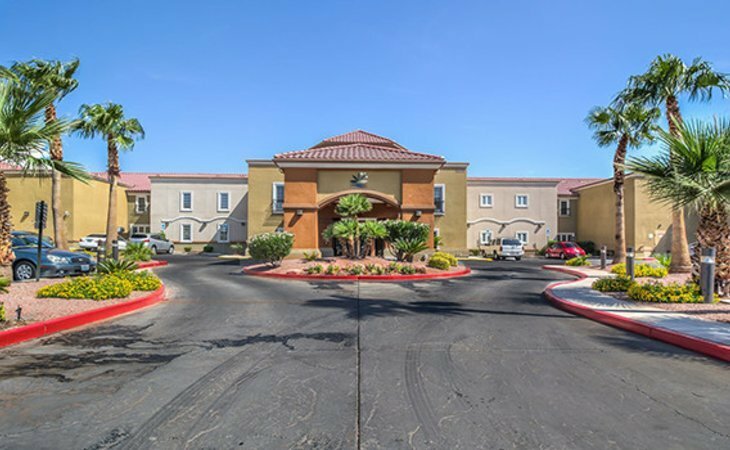 In my opinion Acacia Springs is the #1 senior living community in Las Vegas. I have visited all of the comparable communities in Las Vegas and Acacia Springs is by far the most comfortable and desirable place. When we started our search we looked at about 8-9 places. We only left 3 after walking in the lobbies cause we did not like the way the looked or felt. We only toured 4. We choose Acacia Springs cause of the look and feel. The staff was happy and so were the residents. We got to each lunch and everyone who lived there gave us a great feel for what we wanted. It felt like a good happy place. We love being here. The best place. I have now referred a friend here who loves it also. The Christmas and New Years party and food was amazing. I am very happy with Acacia Springs. Before moving here I looked at 6 other places. My daughter looked at 4 other buildings. This place is by far superior to any other of the places I looked at. Acacia has the best activities and amenities compared to the other places I looked at. I am very very happy here and the management, food and residents are very happy. I would recommend this place to anyone. The entertainment is what I really enjoy. Acacia Springs has the best exercise room, it is a real room with lots of equipment. I also love that the pool is heated and I can go relax there after working out. I visited Acacia Springs and I liked it. I like the anytime dining, and the price is reasonable. I also like the location and the setup. They seem like they have an available cup of wine for the residents once in a while. I liked the representative who showed me around. Some of the rooms had a view of the pool, and you can also go out into the pool. Their exercise room was sufficient, they have a theater room, and a room where you can play cards. On one end it has an area for people needing assistance, but it's more geared for independent living. The food was good. Acacia Springs is clean and bright. The services are excellent. They have a big room for my parents that's bigger than any other rooms. We're very happy with it. My parents have been there for about three months now. The food is excellent. Acacia Springs was clean, nice, and much better than the other community we toured. The place is a little bit small, but it's much nicer. The rooms are nice too and they charge less. We spoke to the staff and had lunch there. The food was really good. There are a couple drawbacks, like they don't have covered parking and it is almost over-crowded, but our first impression and everything else was good. The staff at Acacia Springs seemed very knowledgeable and willing to work with you. The dining room seemed very comfortable and decent. They have a restaurant and a lounge. They have theaters and happy hours. It seems to be a decent place. Acacia Springs was very nice and clean. It didn't stink, and everything looked new. The rooms were very nice. The food was good in the restaurant. We really liked it. Is very nice & open, beautiful building & grounds. Offers any service I could want. Tour guide was gracious friendly & informative. A definite possibly for me. We visited Acacia Springs. It was unacceptable. It didn't have parking and was on two busy streets, one on each side of the building. It’s right on the corner, and the traffic noise would have been horrendous. You had to fight for a parking place, and the streets on each side were really bad and charged $75 for parking. That was excessive. Thank you for your feedback from your recent visit to our community. We are so sorry to hear that you found our parking challenging, but as I’m sure you can understand it is because of this challenge that we need to charge our residents for reserved parking spaces. Touring guests that pre-schedule their visit with us enjoy a reserved parking space which usually alleviates any confusion. As far as traffic, we do have one side of our building that faces Durango, the other side adjoins a quiet residential street, Nevso Drive. Thankfully, our building was constructed in such a way that we do not receive any complaints from our current residents about traffic noise from Nevso, in fact most of our residents enjoy our location because we are so accessible to many local services. We understand that our community may not be for everyone but we would welcome you to return, talk with our current residents and see if we can learn more about how we may be able to help you with your search. I used to live at Acacia Springs and I loved it. I liked the people there because they were intelligent and educated. They would come in and take your blood pressure. It was nice except for the shape of the apartment. I didn't like the apartment because the shape wasn't very good. The living room was more like a hallway shape and there was no room for a new couch. The bedroom was fine. I thought the bathroom was way too big and there was a personal kitchen. I hated the food. It used to be very nice, but I don’t know how it is now. There were many activities. However, I didn't go to many because I had my private ones. Acacia was very nice and also newer. If I were going to one, that's the one I would go to. The lady who took me around was very pleasant, and they took me on a nice tour. As we saw people along the tour, they were all very pleasant. They had more activities to offer there. They had a larger library, a movie theater, card room, and a very nice physical fitness room. I didn't see it, but I'm positive they have a spa and an outdoor swimming pool. They had a nice dining room that was open from about 7 a.m. until 7 in the evening, and you could go and eat any time you wanted. They also had a little bistro where you could go get snacks and things at night. The 2-bedroom apartment was a little bit bigger in square footage. They have balconies on the second floor. The ones on the first floor had little patios that overlook the pool. I went through Acacia twice. Once with my daughter and my son, and then on my own where I could be one-on-one with the tour director there. It was a very nice tour; it didn't rush. They showed me everything, like the laundry and housekeeping. My main concern is that it's near where I live now, which is near my two sisters who are also older. I will have easier access to see them or for them to see me. The only thing I had against the Acacia Springs was the parking fee. It was very high because of the limited amount of parking they have there. If you didn't get the reserved parking, you'd have to park your car out on the street. That was really the only downfall about that place. But who knows how long I am going to keep my car anyhow. My wife is living in Acacia Springs. We choose it because the people there are very nice and polite. They are extremely good. All the amenities are good. We like the way things are set-up. The grounds are very clean and well-kept. The dining room and food are very good. They have activities like cards and movies. I definitely recommend them to others. Describe the overall population of assisted living residents at Acacia Springs. What is their average age? What are their favorite things to do? Living at Acacia Springs means being a part of an active, vibrant community. Enjoy delicious all-inclusive dining, a wealth of social activities and the freedom to explore your interests. Join friends on our putting green, take a dip in the heated pool, or take in a movie in our theater. There are countless opportunities to connect, grow and live up to your full potential. What programs or activities does Acacia Springs offer to enrich residents' well-being? What are the makings of a vibrant, active community? Part of the recipe is a full calendar of life enrichment programs for you to choose from— created by listening to and learning from you. From exercise and wellness to adventures in the larger community, we provide great sources of joy, excitement and relaxation—each and every day. We’re always sure to make time for laughter, connection and friendship, and include those ideals in everything we do. We encourage everyone—not just our residents but also our team—to lead healthier, more active lifestyles, helping build a culture that celebrates every moment in our journey together. What places are near Acacia Springs or within walking distance for assisted living residents to enjoy? Acacia Springs has the best of both worlds. It is located only minutes from the main strip of Las Vegas in a cozy neighborhood of the Spring Valley area. Outdoor and indoor activities are available on-site and readily available transportation is available to bring you wherever you'd like to go! What transportation services does Acacia Springs offer to assisted living residents? What makes the chef or dining program at Acacia Springs exceptional? What kind of menu can assisted living residents expect? We offer all-inclusive, restaurant-style dining. What time is dinner? Whenever you choose. With dining anytime, incredible menu items and multi-venue options, you can savor the day on your own schedule. Whether you are an early riser or late sleeper, our program provides the flexibility to meet your unique lifestyle. You’ll always have a seat at the table. What safety features or security measures does Acacia Springs offer to assisted living residents? We believe in the power of community. As we age, it becomes more important that we feel supported in living our best lives. Our compassionate care and our passion for elevating senior living are proof of our commitment to you—our family. How does Acacia Springs keep residents' families informed about their loved ones? We offer a calendar as full as you want it to be. Feel free to choose from any number of activities, or just relax in the comfort of home and in the company of friends. We create open lines of communication through phone, internet and being available to answer your questions at any time. If Acacia Springs accepts dogs or cats, what indoor/outdoor areas can they enjoy? Private apartments and outdoor walking paths. We are a pet-friendly community and welcome pet owners. Describe the overall population of independent living residents at Acacia Springs. What is their average age? What are their favorite things to do? Centrally located near the 215 Beltway and on the edge of Summerlin our community is close to a multitude of shops (Downtown Summerlin), fine dining restaurants (Red Rock Hotel & Casino). We are centrally located between Summerlin and Southern Hills Hospitals. We are 10 minutes from the Strip. What are some recent off-site events that the community activity director at Acacia Springs has organized? Many of our residents attend events at the Smiths Center and at the properties on the Strip. We take trips to Hoover Dam and some of the surrounding areas for those who are more adventurous. At Acacia Springs, we provide all the ingredients our residents need to live up to their full potential. From fitness lessons to therapeutic programs and everyday activities that define our vibrant community, everything we do is guided by a sense of purpose. What transportation services does Acacia Springs offer to independent living residents? From around your neighborhood to out in the town, we want you to live your life to the fullest. We welcome residents to explore nearby attractions and events at their leisure and ensure that your travel is safe and convenient. Whether it’s to attend medical appointments or enjoy the local flavors and shops, we connect you with transportation you can count on. We offer our shuttle service to our residents year around. What makes the chef or dining program at Acacia Springs exceptional? What kind of menu can independent living residents expect? Food brings us together. Whether sharing an intimate meal with a best friend or celebrating a special occasion with all your loved ones, we guarantee that your appetite for connection with others and for the most delicious food will be satisfied. What time is dinner? Whenever you choose. With dining anytime, incredible menu items and multi-venue options, you can savor the day on your own schedule. Whether you are an early riser or late sleeper, our program provides the flexibility to meet your unique lifestyle. You’ll always have a seat at the table. We have a farmers market for your fruits and vegetable ready for you savor whenever you choose. We have a outdoor heated swimming pool to 88 degrees year around and also have a beautiful landscaped patio with putting green. There is a large pergola where you can relax and enjoy the calm and tranquil ambiance, while staying out of the sun. We also have our Press Box Lounge where you can sit and enjoy a glass of wine or beer and watch some sports while chatting with your friends. We have a exciting choice of finger foods to savor while relaxing with your friends or family. Our indoor whirlpool spa, Fitness Center, Beauty Salon/Barber Shop, Billiards room, 60 seat movie theater, library, Press Box Lounge to round out the choices. What safety features or security measures does Acacia Springs offer to independent living residents? What safety features or security measures does Acacia Springs provide to protect residents who wander? At Acacia Springs it’s easy to stay as involved and engaged as you choose. Meet up with friends for happy hour in our pub, or take in a recent blockbuster in our 60-seat movie theater. Test your aim in our billiards room, or work out with a trainer in our fitness room. Step outside and discover peaceful outdoor spaces. Practice your short game on our putting green, join a water aerobics class in our outdoor heated pool, or simply relax in our beautiful courtyard. We have a year round heated pool and spa, which host a variety of activities including water aerobics. Also have a 6- seat movie theatre, concierge services, indoor whirlpool spa and outdoor pool, fully appointed guest suites. and more! What should caregivers and potential residents know about Acacia Springs?